I'm still a bit in shock that it's February already, let alone the fact it's 2017. Last year I was running a second blog on my house renovations and home interiors and one of the posts that was loved was the Pantone colour of the year. As I'm now moving those posts to this blog, I thought it was only right we talk about the 2017 colour of the year! 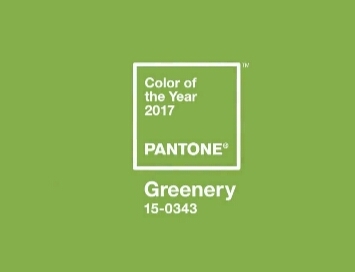 2017 welcomes Greenery pantone 15-0343 as the colour of the year with its fresh, spring vibes and it's a perfect symbolic colour for new beginnings. This fab colour is not only a reminder of nature and all it's beautiful offerings but is perfect for interior design. It can be mixed with other shades of green in indoor plants or statement furniture or walls and it can be paired with just about anything. This colour is already available in just about every homeware spring collection and can be matched perfectly with your rose golds, marble, pastel shades and neutrals. Want a heads up to the shade without going all out? Why not simply add a few potted plants? They don't even have to be real! Check out these plastic beauties from Primark for example. It's already hit the fashion trends too with gorgeous dresses and green trousers suddenly making a come back! A pair of Greenery coloured skinny jeans, a white t-shirt and rose gold jewellery. Hello! What do you think of the colour of the year? I was ahead of the trend as decorated dining room in green a few years ago although my mum always said it was bad luck to decorate with green. I love this colour. It's so nice and goes well with neutral tones. I'd love some green cushions in my lounge and the plants look so refreshing! I adore green. This colour is gorgeous and I will definitely be searching it out in nail polish shades!